2014 Coachella lineup announced: OutKast reunion! 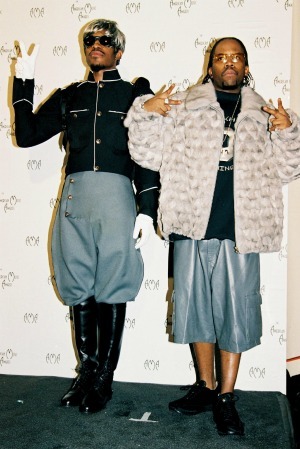 After a six-year hiatus, Andre3000 and Big Boi will reunite as OutKast at the 2014 Coachella music festival! See who else is in the lineup. Sorry Miss Jackson, this is for real: OutKast is finally reuniting! Andre3000 and Big Boi will take the stage as headliners at Coachella 2014 in April as a rumored kickoff to a summer tour. More than 150 acts will play throughout the two April weekends. In addition to OutKast’s Friday shows, Muse is slated to headline Saturdays and Arcade Fire will close out Sundays. Other highlighted performers include The Replacements, Beck, Calvin Harris, Broken Bells, HAIM, Neko Case, MGMT, Girl Talk, Foster the People, Ellie Goulding, Neutral Milk Hotel, Lana Del Rey, Pharrell Williams, Chromeo and Queens of the Stone Age.